We tend to watch films to escape into a world that has been crafted for our enjoyment. Simply because films are categorized as entertainment does not solidify them into a state of pleasure. They are able to create images that tell stories of pain, consequences and regret. They are not the brightest nor are they the easiest stories to tell but they reflect images of our world not always exposed to the masses. It is through stories such as these where the true art of filmmaking emerges. Numerous pieces join together in a fluidity that complement each other and strengthen the film as a whole. 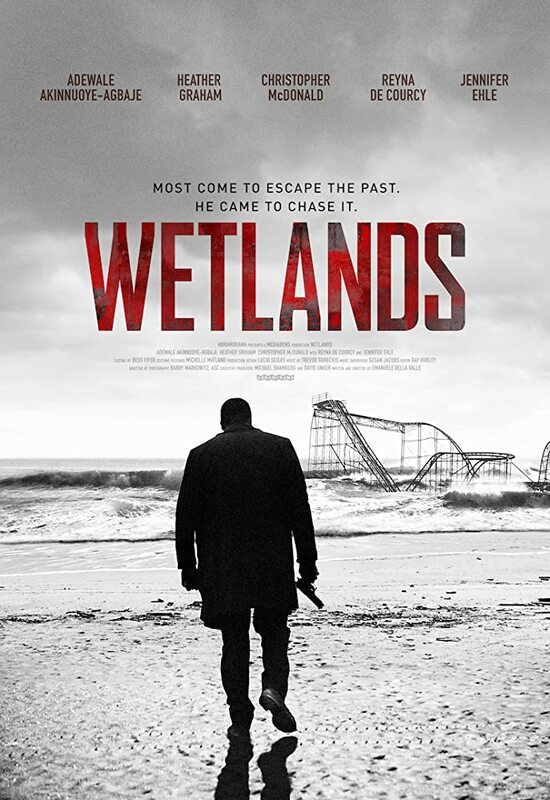 Emanuele Della Valle’s first feature film Wetlands is a gritty, dreary tale of a former narcotics officer seeking redemption with his teenage daughter. The film begins with Detective Babel Johnson not in the best frame of mind having a meltdown then… the film goes into its opening credits. It is quick and emotional scene that grabs your attention immediately; it is only strengthened more by the powerful piano score by Trevor Gureckis that bookends the film. Babel, played by Adewale Akinnuoye-Agbaje (Lost, Oz, Suicide Squad), is coming off an incident that cost him his family and almost his job. He transfers to the outskirts of Atlantic City known as “The Wetlands” in order to reconnect with his ex-wife, played by Heather Graham (Boogie Nights, From Hell, Bowfinger) and their teenage daughter. Babel is partnered with Detective Paddy Sheehan, played by Christopher McDonald (Quiz Show, Happy Gilmore, Requiem for a Dream), a former jock turned cop turned alcoholic and obsessive gambler. Although new to the area Babel’s past does not stay quiet for long, as almost everyone he meets is familiar with “his incident in Philadelphia”. Babel is also confronted with having to deal with his wife’s “situation” in her new romance with a young female. Credited as Surfer Girl, Reyna de Courcy consumes the role of a frightened, determined, delusional, fragile girl. His ex-wife’s new relationship puts Babel’s family in danger in the form of drug dealing mobsters. The film’s backdrop carries the eminent danger of an oncoming storm threatening to destroy the area. It is through small things like this that paint a larger picture. Early in the film there is a mention of previous storms that hit that did not damage areas that badly but this new storm is the opposite of those. Numerous stories collide at the time the storm hits, which elevates the film on a story telling level. The previous storms are a metaphor where there have been challenges to overcome but this new storm will completely change the landscape of all the film’s characters. It is hard to find redeemable characters in this film where even in Babel’s journey there are missteps that force us to view him in a different light. The film is enhanced by the hand of its cinematographer, Barry Markowitz, who paints a very dark and bleak world for these characters; where even a beach scene felt as isolated and disenchanted as a gloomy basement. The film’s theme in my opinion is all based on choice. Each character is defined by the choices they have made and will make. Much like in reality, life is dictated by the decisions we make and based on that route they may work out or may not. It is evident that the choices our characters have made have not put them in the best situations to be in. Even when we know the consequences of our actions that does not stop us; as human beings we are all flawed which makes us are own worst enemy. Paddy’s uncontrollable gambling, Babel’s past resurfacing, his ex-wife’s refusal to act like a real mother instead of being a selfish trust fund baby and surfer’s girl inability to stop stealing drugs from mobsters; everyone suffers from each other’s actions which in themselves were only created by their making. As I mentioned earlier it is through the film’s director, music composer, cinematographer and above all the actors that this film is as solid as it is. The film may lack the right composition early on as many different elements are introduced, but by the end, they all converge giving us a clear picture. The film’s title and location also serve as a symbol for the entire film. It is a location where nothing can really settle; everything is just tied down and slowly sinking away. I truly believe director Della Valle had a strong vision of the film’s themes where even “a happy ending” is surrounded by a gloomy, dimly lit veteran’s lodge with the only bright color in the entire film being that of a nurse’s smock. Both Akinnuoye-Agbaje and McDonald take top notice in this film as their performances are grounded in a dark, stark whirlwind of emotional consequence.